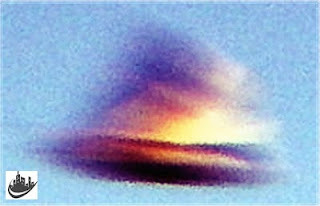 Inexplicata-The Journal of Hispanic Ufology: Argentina: "Best Photo of the Decade"? Contributing editor Guillermo Gimenez sends us this photograph -- taken by Alejandro Mikitiuk on December 12, 2:38 pm -- that is being touted as the best Argentinean UFO photo of the decade. Mr. Mikitiuk was taking photos of a house that he was building on his property in the Sierras Bayas district of Olavarria, Province of Buenos Aires. 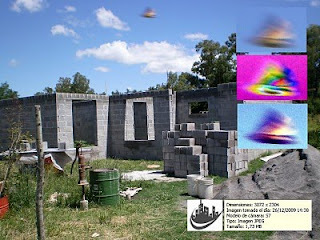 Photo analysis performed by Patricio J. Barrancos yields a "positive" result:"there is a solid object in flight at low altitude and at a relative distance from the indirect witness." Photo courtesy of Luis Burgos and FAO team.